Black Label Productions - Amazing things. Live. No shows currently on sale. 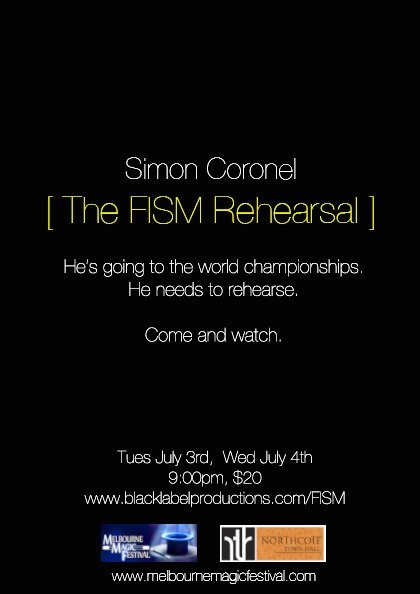 Simon Coronel was born in Melbourne, lives in Hollywood, and is classified by the US Government as an 'Alien of Extraordinary Ability. Now he's back in Melbourne for five shows only. Come and see what he's learned. 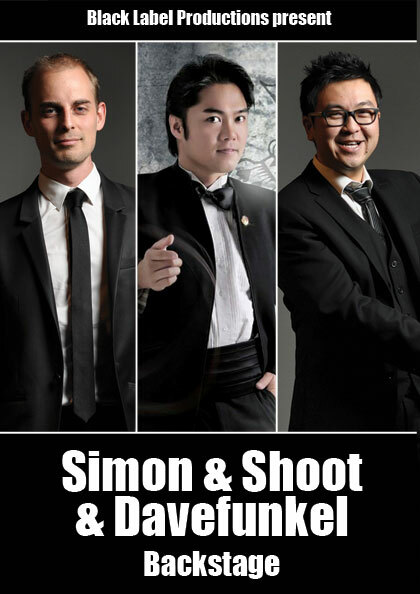 Shoot Ogawa: international magic superstar, Simon Coronel: international magic innovator, and Dave Lee: local IT consultant, team up for a unique three-man theatrical magic experience. 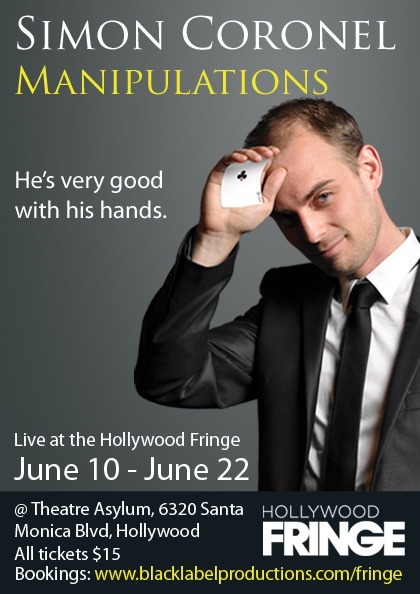 Award winning Australian illusionist Simon Coronel returns to the Hollywood Fringe. 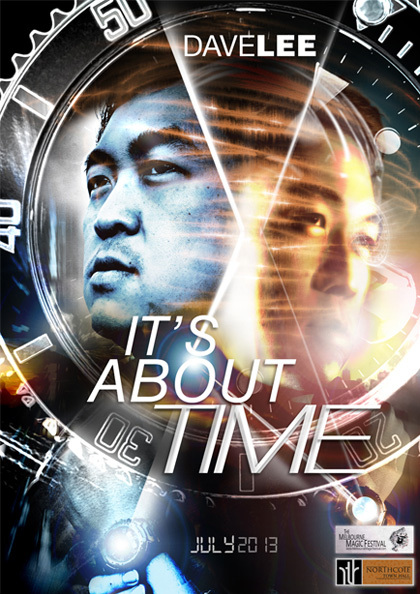 Featuring an amazing blend of illusion, theatre, comedy, and music, this is an hour of entertainment that will change the way you see reality itself. 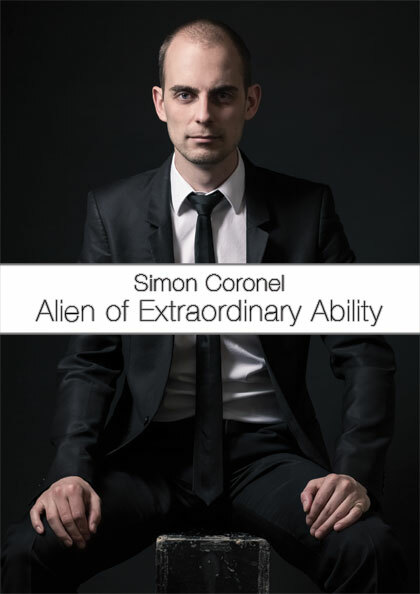 In January 2014, Simon Coronel was designated by the US Department of Immigration as an 'Alien of Extraordinary Ability.' He now lives in Hollywood. He has some amazing stories. These are some of them. There are glitches in reality; things that seem impossible but aren't. Award winning illusionist Simon Coronel guides you through a series of amazing moments - with a juice bottle, a padlock, a jelly snake, and much more - leading to a finale that will change the way you see reality. Simon Coronel and Dave Lee return for their third ever live collaboration. 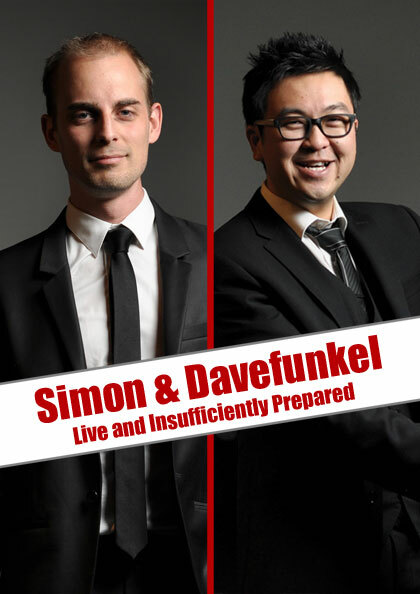 After having both completed hit shows at the Melbourne Magic Festival, Simon and Davefunkel are back and ready for shenanigans. A workshop on social and impromptu magic, which will leave you able to impress people in any situation at a moment's notice. An ultra-private secret workshop with one of magic's greatet performers. Limited to just six people. 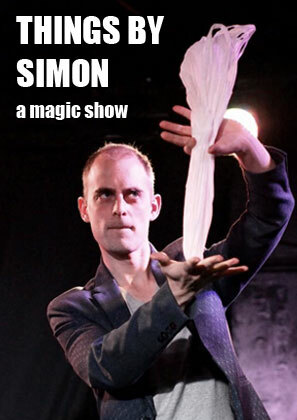 Award winning illusionist Simon Coronel returns to the Melbourne Magic Festival. Featuring an amazing blend of illusion, theatre, comedy, and music, this is an hour of entertainment that will change the way you see reality itself. Simon Coronel and Dave Lee return for their second ever live collaboration. After having both completed hit shows at the Melbourne Magic Festivial, Simon and Davefunkel are back and ready for shenanigans. 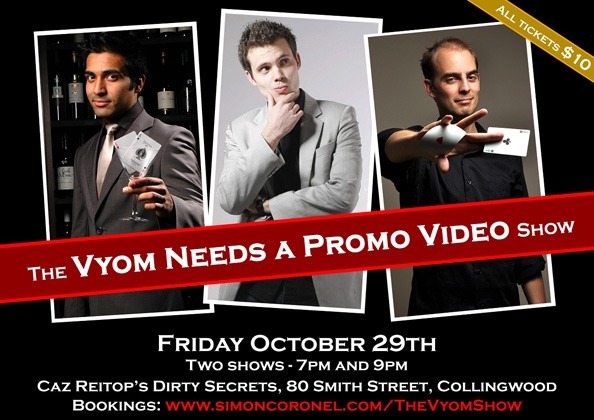 Simon Coronel presents his new show debuting at the 2013 Melbourne Magic Festival. A series of moments of astonishment. Presented and preserved by an international award winner. It's that time of year again! 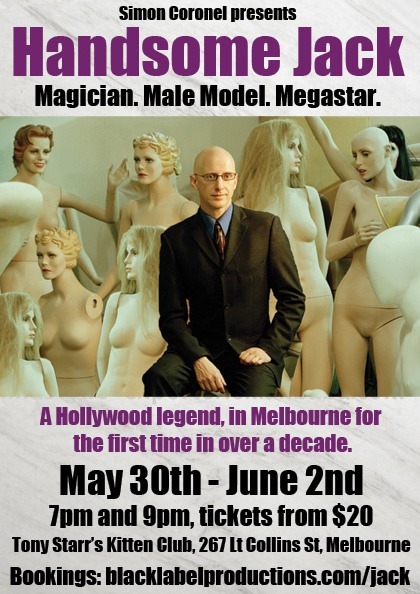 At the Melbourne Magic Festival, Dave Lee does a show. It's about time. 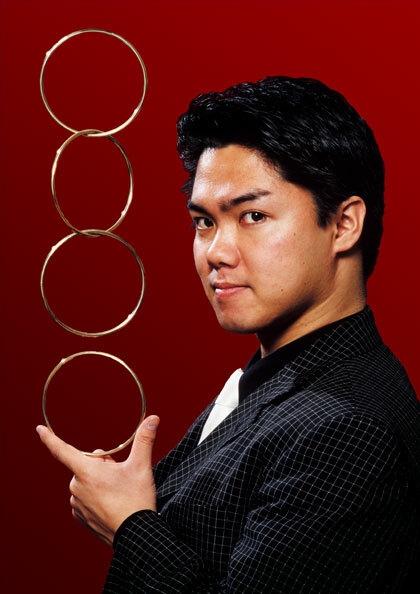 Simon Coronel is representing Australia at the magic world championships. He needs to rehearse. Come and watch. A Hollywood legend, live in Melbourne for the first time in over a decade. 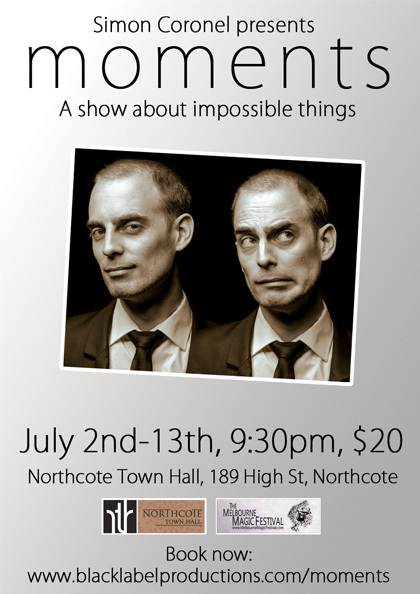 Experience the magic, comedy, and superstardom that have made Handsome Jack a legend in the industry. 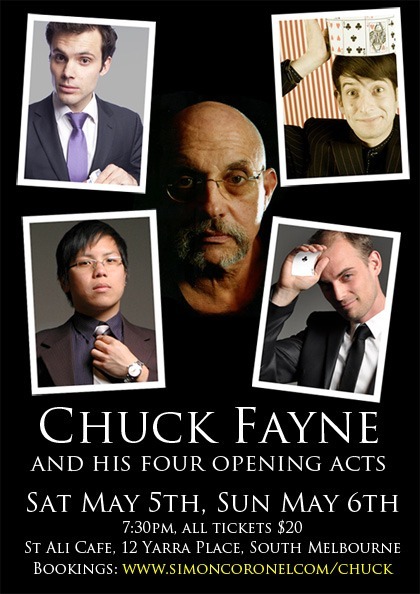 Legend of magic Chuck Fayne performing in a rare live appearance. Accompanied by four of his students - Anthony DeMasi, Luke Hocking, Yao Wong, and Simon Coronel in an extravaganza of amazing entertainment not to be missed. 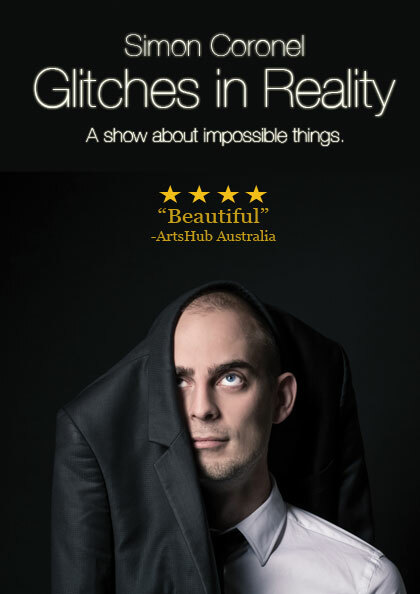 This year at the Edinburgh Fringe Festival, take a seat, embrace the manipulation, and experience the impossible. 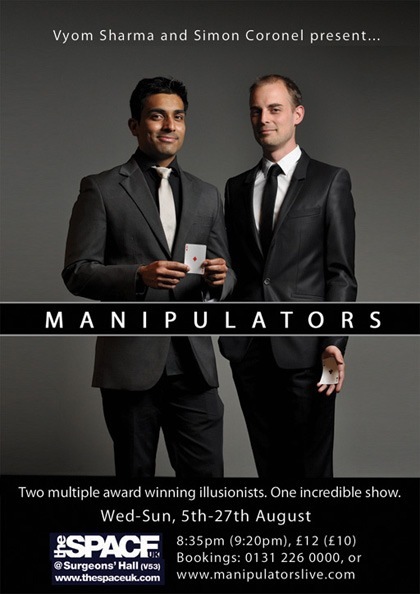 Two award winning close-up illusionists join forces to amaze you, delight you, and manipulate you. Charmingly. Last year at the Hollywood Fringe, this show was a finalist in both the Best International and Best Cabaret categories. Come and find out why. 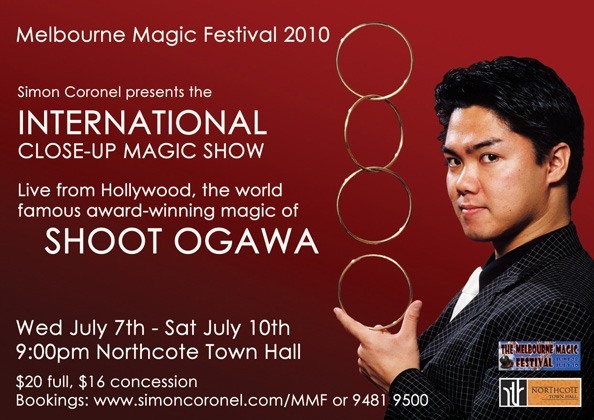 International magic sensation Shoot Ogawa in his first ever public Melbourne appearance. His name is Vyom. He badly needs a promotional video. Come and be involved in its making. 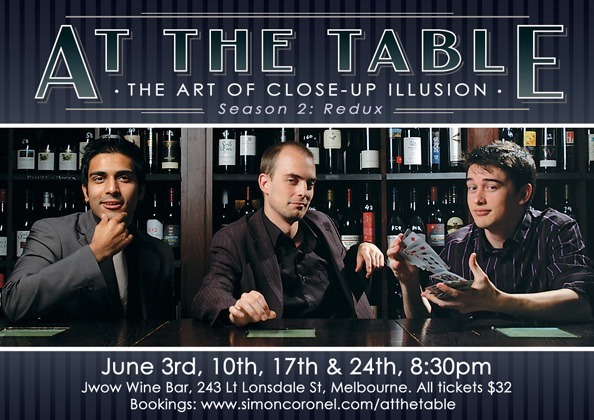 The second season of the extraordinary At The Table. 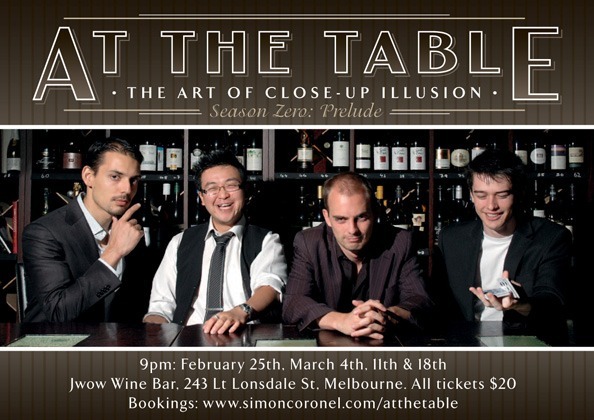 Close-up illusions, live and intimate in Melbourne. The art of close-up illusion, live and personal. An showcase of an art form rarely seen in public. All site content © Black Label Productions, and/or respective show producers.